The conference, hosted by Newbean Capital, is a chance for commercial growers to see and experience new technology, meet with funders, and learn from some of the most successful companies in the indoor agriculture industry. 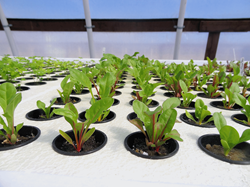 Swiss chard is grown in a HydroGreens facility in Pahrump, Nev.
Indoor agriculture is experiencing rapid growth as drought, supply chain challenges and the scarcity of new farmland force growers to seek more efficient and sustainable growing methods. The leaders in this growing sector of agriculture will meet at the 3rd annual Indoor Agriculture Conference on March 31 and April 1, 2015 in Las Vegas to discuss the present and future of this expanding industry. The conference will be a chance for commercial growers to see and experience new technology, meet with funders, and learn from some of the most successful companies in the industry. Agriculture technology companies, suppliers and automation companies will also have the chance to meet and mingle with leading vertical farmers and commercial greenhouse operations. In its first three years, the Indoor Agriculture Conference has captured an international audience and attracted some of the top names in the business. Last year attendees came from as far away as Sweden, India and Israel. Vendors included LED lighting systems, nutrient delivery systems, and automated technology. The 2104 event was sponsored by Philips Lighting, Whole Foods Market, Johnny’s Seeds, Illumitex, Heliospectra, Hort Americas, Growtainers, Envirotech Greenhouses, Cravo, Agratech Greenhouse Manufacturers, Plug Connection , Method Seven, DRAMM, Modern Farmer, CropKing, Nature’s Bakery and Davidson’s Organics. In 2015, the conference will focus on educating and inspiring established commercial growers in the indoor agriculture industry while introducing them to the newest and most innovative technologies and systems. This year’s conference is set against the backdrop of California’s severe drought, which has impacted one of the world’s most productive agricultural regions. According to UC Davis, the drought has cost Californian agriculture $1.5bn and is expected to continue through 2015. Indoor agriculture’s remarkable water efficiency and predictable delivery of fresh fruits and vegetables independent of climate or weather patterns make it a reliable source of fresh produce even in drought-stricken or arid regions. The conference is tailored toward corporate executives from the technology, greenhouse, farming, and food and beverage industries, along with hydroponic, aquaponic and aeroponic startups. Organizers are expanding the conference’s vendor exhibit area this year, and it will be integrated into the main conference hall. Newbean Capital, the host of the conference, is a registered investment advisor; some of its clients or potential clients may participate in the conference. In arranging the event, Newbean Capital is ably assisted by professional Las Vegas technology events firm, Reinventing Events, and by the public relations professionals at the Abbi Agency. The Indoor Agriculture Conference is also announcing a second, more intimate event in New York City for fall 2015. The event will focus on the technologies and growing techniques that work best in the Northeast environment, and the conversation will be limited to approximately 100 participants. Features – vendors, ‘ask me anything’ sessions with leading industry CEOs, drinks party on first night at 24 hour venue.